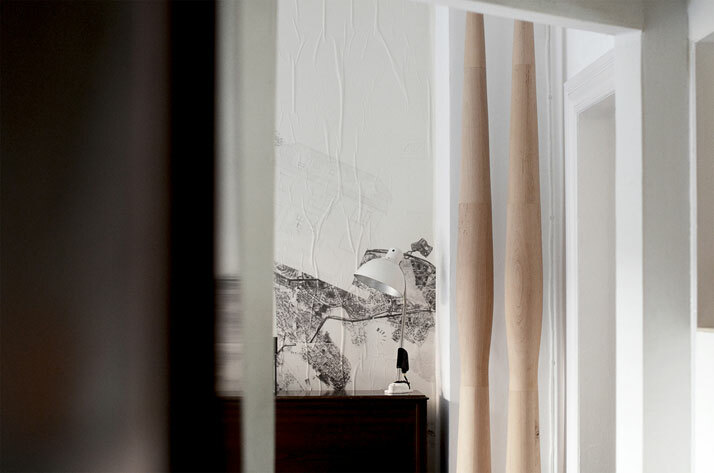 With the development of open plan interior architecture on the increase, there is a growing need to define space. And what better way than through the partitions designed by Copenhagen based ÖRNDUVALD studio, aka Pétur Örn Eyjólfsson and Søren Oskar Duvald, architects from The Royal Danish Academy of Fine Arts. 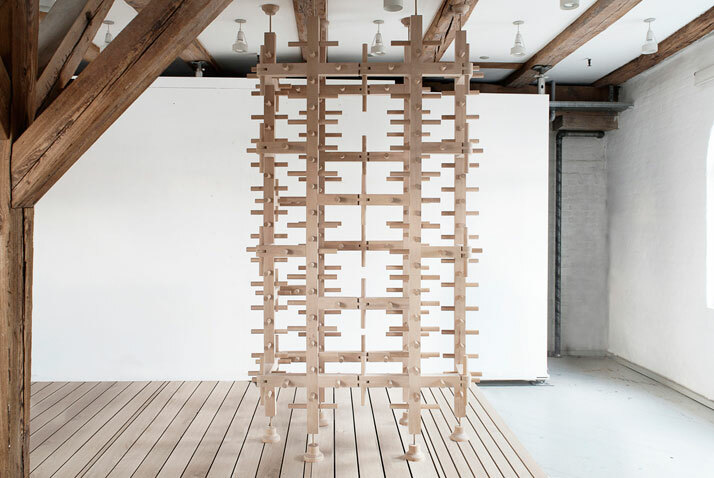 Titled Partition, the project deals with temporary spatial changes, where two different dividers, the Frame and the Columns, act as the foundation to the modern day room separator. 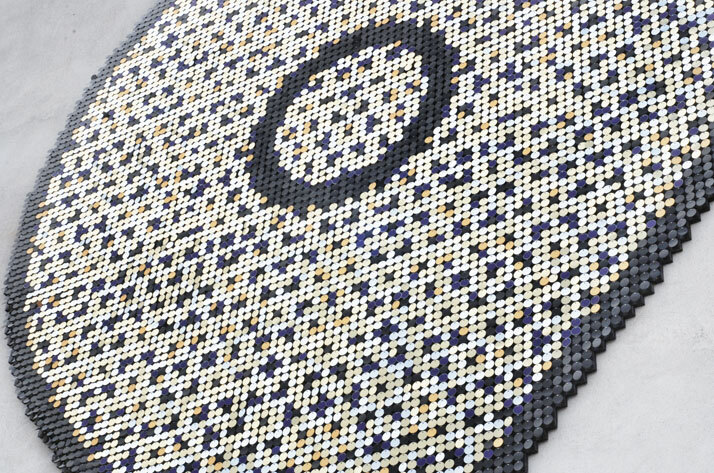 The design of the two dividers focuses on texture and surface, as well as functionality and physical and visual relations. 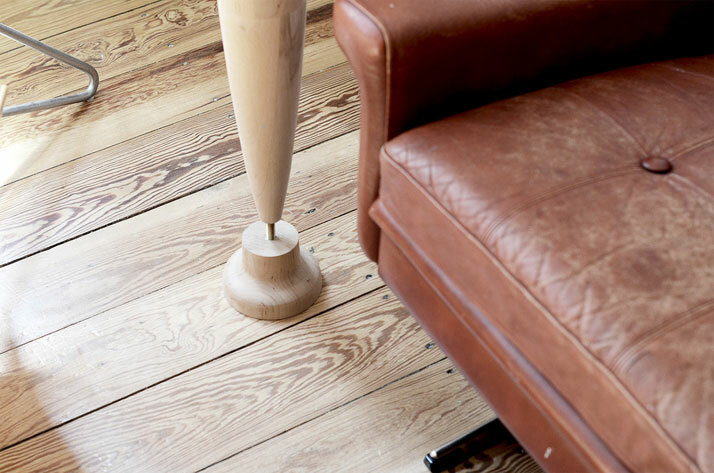 The project has been traditionally crafted with time-honored furniture crafting techniques which after all, is what its design is all about; and that is where the experimentation lies - in making an architectural element look like a furniture piece. 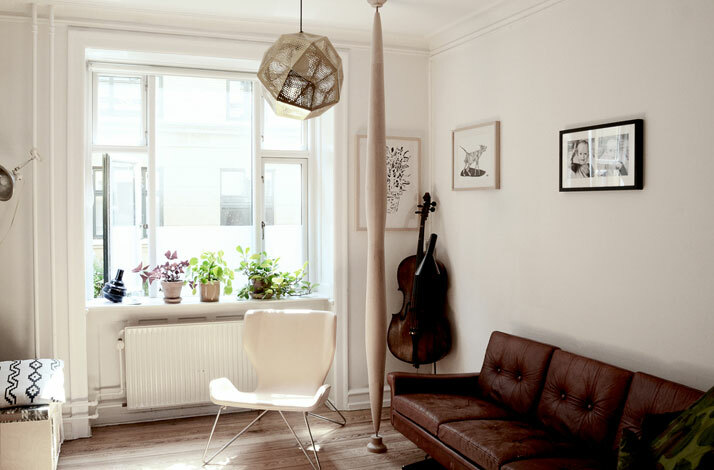 Frame / Partition, photo © ÖRNDUVALD. 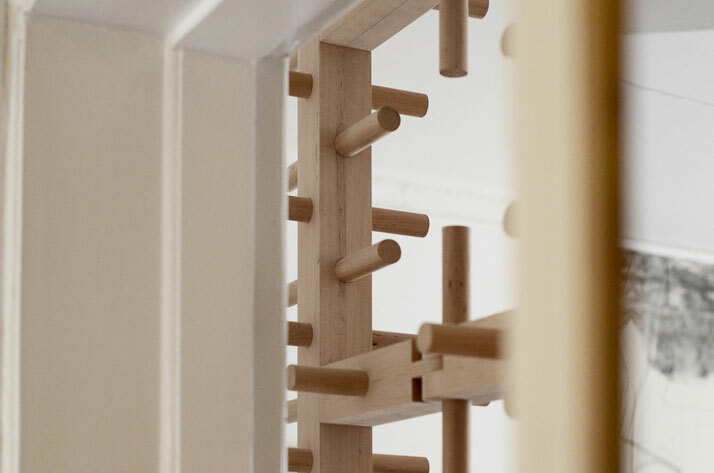 Round sticks which have been dowel joined construct the Frame which is designed in such a way as to make reference to the conventional way of building a plasterboard partition. 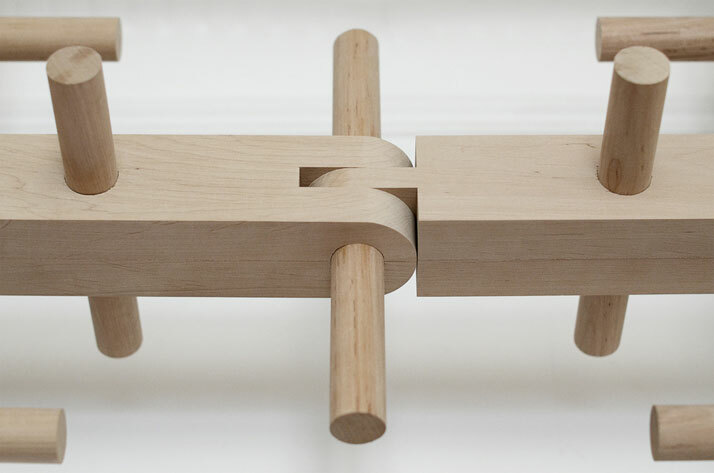 The dowel joint round wooden sticks are inserted in all the posts and horizontal bands for constructive, as well as functional and decorative reasons whereby a hanger is now created. 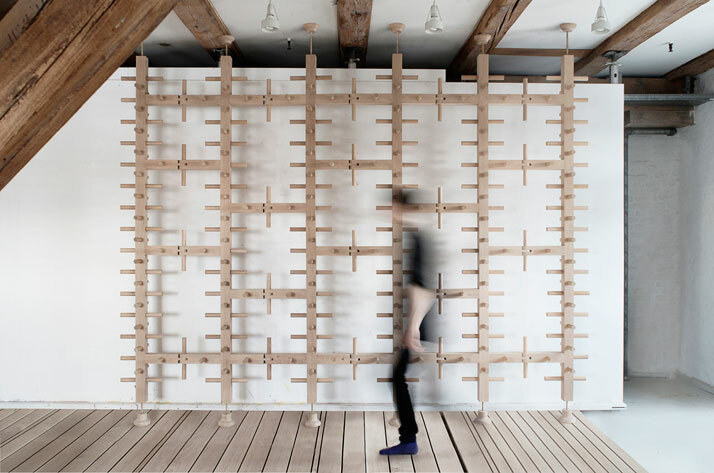 As a result, the conceptualization of Frame allows for flexibility in design and in creating any shape or structure off of the Frame partition. 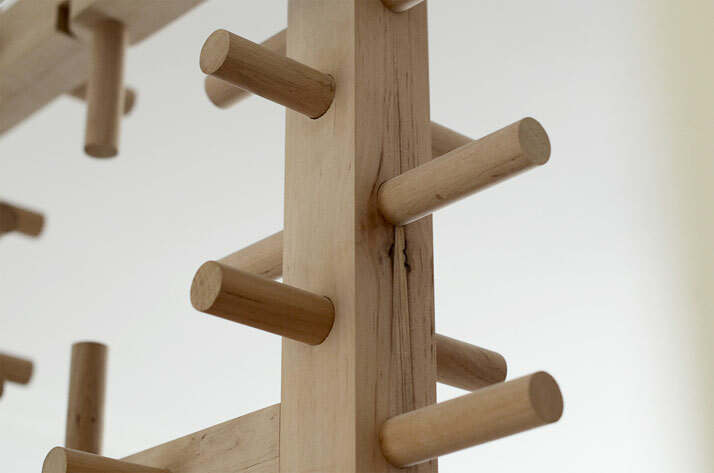 Identical lathe shaped Columns crafted from red alder make the second partition; with their modern design and lack of heavy ornamentation, the lathe shaped columns pay homage to the craft of woodworking. 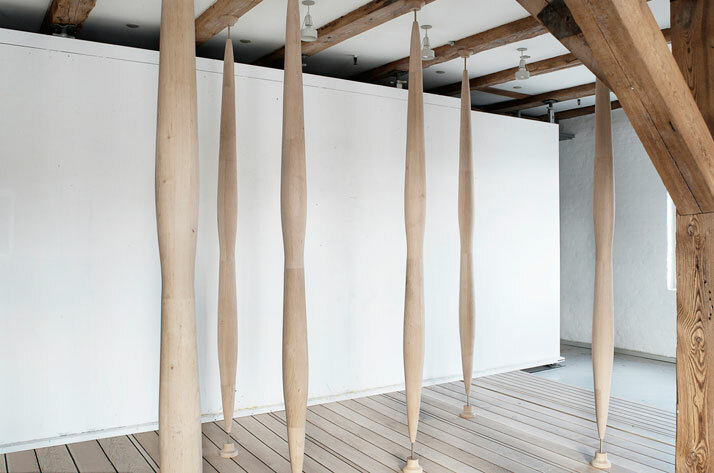 Providing for various spatial arrangements and endless possibilities in an attempt to the define space they inhabit, the Columns have been designed for ceiling heights of approximately 270 centimeters (8’9”) - and are mounted by means of threads that can be adjusted according to the height of the room. Column / Partition, photo © ÖRNDUVALD. 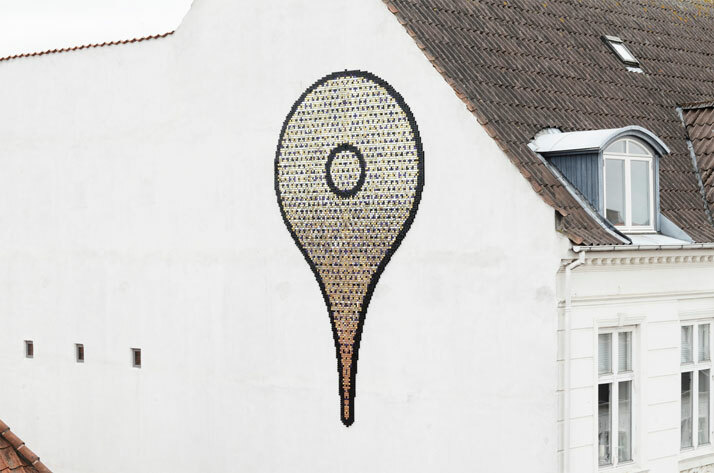 Apart from wood, Eyjólfsson and Duvald love sequins and after their Piles Of Soil, Water And Rubble (previously featured on Yatzer), they recently completed a Pin made of 10,078 sequins as part of the ''Public Art Horsens'' exhibition (18th – 30th June 2013), curated by Simon Caspersen from ArtRebels and photographer Henrik Haven. 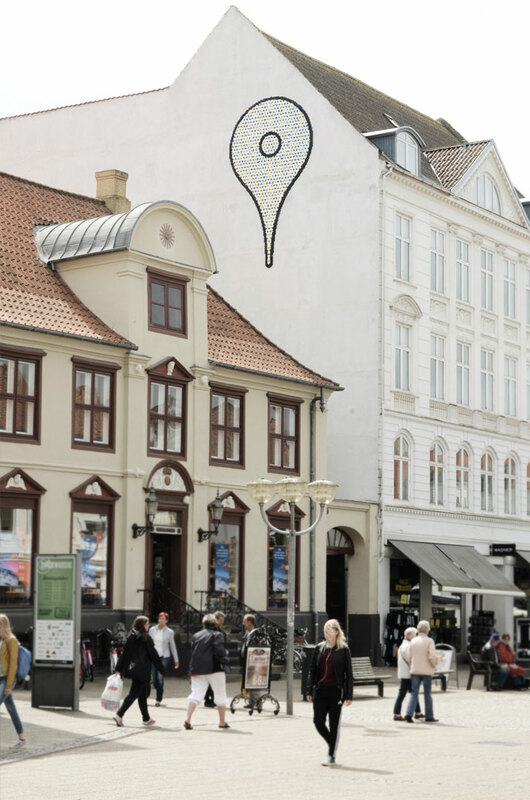 Pin is located in the city center of Horsens, Denmark, most precisely at 55° 51' 42" N ; 9° 50' 47" E, amongst a range of murals, sculptures, performance and installations created for the exhibition by artists such as Escif (Spain), Sam3 (Spain), Pøbel (Norway), Brad Downey (USA) and Thomas Dambo (Denmark). 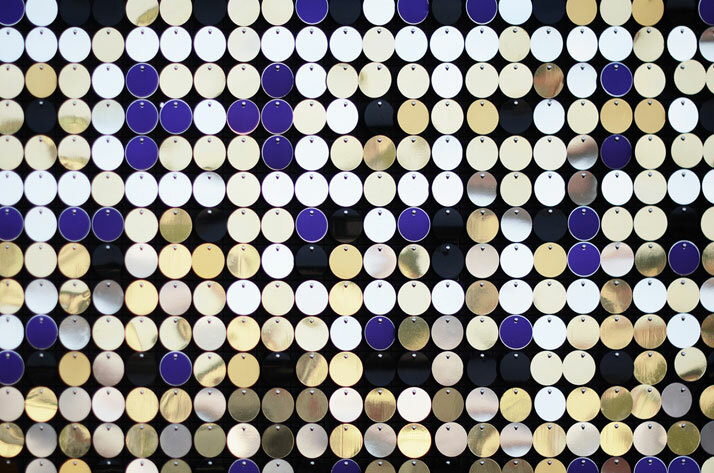 PIN / 55° 51' 42" N ; 9° 50' 47" E, photo © ÖRNDUVALD.